The Start of the new season has flourished and we hope this year will provide you with the best results through your hard word and determination. The previous year ended with the Specialist Officer Exam and since this Clerk notification came in the previous year , this exam pertains to the year 2017, even though the mains exam happen in a different year. Reasoning Ability , one of the easiest section to crack the exam (almost every exam) and this section seems to be in the easier range in terms of difficulty. Apart from the Seating Arrangement and the Puzzles (even they are easier ) , other topics would be a cake walk for the candidates. 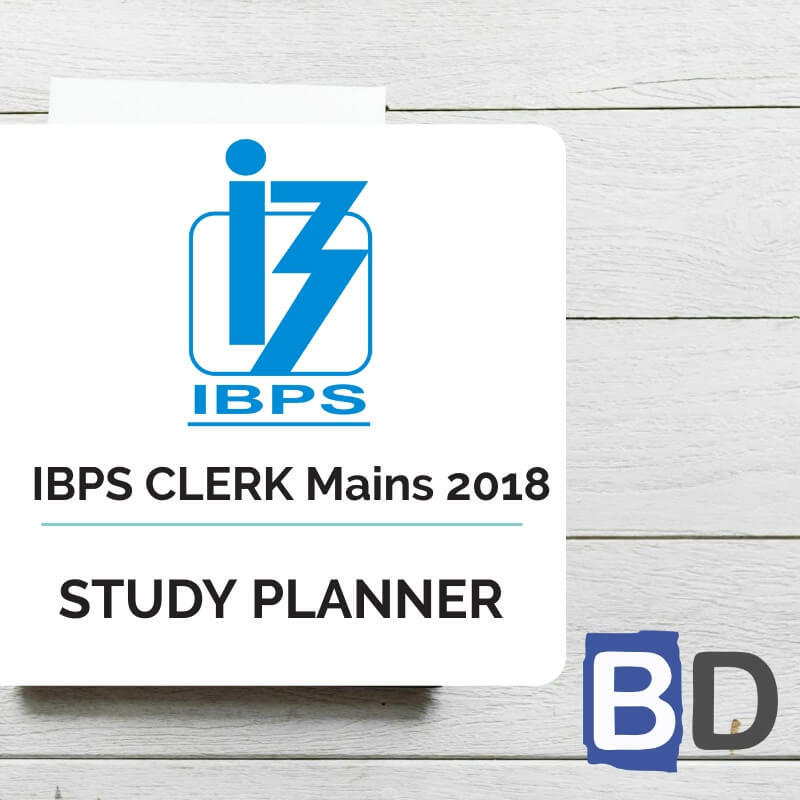 In the recently held IBPS CLERK PRELIMS EXAM , the alphabet series and also the alphanumeric series constituted for the maximum marks, so you can expect the same level of questions in the mains exam too. New Pattern Questions will make this section still more complex and even in the recent exams, only some sections will be asked in the new pattern and not all the sections. Eight persons M, N, O, P, A, B, C and D are sitting in a straight line. They like different colours via Blue, Green, Grey, Yellow, white, Orange, Maroon and Black. All are facing north but not necessarily in same order. The one who like Orange colour sits second to the left of the one who like Maroon colour. The number of people sits between A and White colour is same as between the one who like white colour and D. Only three people sits between A and the one who like black colour. C and P are immediate neighbours of each other but neither like Black nor Orange. As many people sits between N and C is same as the one who like green and grey colour. Neither A nor black colour sits at extreme ends. The one who like white colour sits second to the right of A. Only one person sits between P and O. The one who likes yellow colour is an immediate neighbour of both Blue and Orange colour. N neither likes blue colour nor at extreme ends. Q.1) Which of the following colour is like by C? Q.2) What is the position of O with respect to C? Q.3) Who among the following sits at the extreme ends? Q.4) If all of them facing south, then who sits second to the left of C? Q.5) Who sits second to the right of M after the arrangement? Seven friends are A, B, C, D, E, F and G. All are sitting in a Straight line some of them facing north and others facing south. Not more than two adjacent persons are facing same direction. D, who sits in the middle of the row facing north, is not an immediate neighbour of Both A and C. Both the persons sit at the extreme end facing opposite direction. Only One person sits between B and G. C and A are not sitting in an extreme ends and facing opposite direction. B sits third to the left of D and facing same direction as D.F sits second to the right of G.
Q.6) What is the position of G with respect to E? Q.7) If all Person are arranged in reverse alphabetical order from right to left the who among the following sits immediate left of D? Q.8) If C sits Second to the right of D, then who among the following sits third to the right of F? Q.9) How many persons sitting between C and A? Q.10) How many Person are facing South direction? D.11-15) Study the following information carefully and answer the questions given below. Ten persons K, L, M, N, O, P, Q, R, S and T are sitting in a row. Some of them face north while some of them face south. Each of them like different fruits viz. Apple, Banana, Blackberry, Blueberry, Cherry, Fig, Grapes, Guava, Mango and Orange. Three persons sit between P and R. O and S faces same direction. Four persons sit between M and one who likes Fig. Q likes Orange. T sits second to the right of N. L is an immediate neighbour Q who sits fourth to the left of O. N does not like Apple. One who sits to the immediate left of M likes Grapes. Persons who are like Apple and Fig are immediate neighbours. One who likes Blueberry sits fourth to the right of L. Two persons sit between R and L. Immediate neighbour of M and L likes Grapes. Neither N nor O sits in the end of the row. K likes Guava. One who likes Mango sits third to the right of K. Three persons sit between one who likes Orange and Cherry. Only two persons sit in the right of P. Immediate neighbour of K does not like Blackberry. Immediate neighbours of T faces opposite direction. Q faces south. R sits in the left of T. One who likes Banana faces south. Q.11) How many persons sit between R and one who likes Banana? Q.12) Who among the following likes Blackberry? Q.13) Four of the following five are alike in a certain way based on the arrangement and hence form a group. Which of the following does not belong to the group? Q.14) Which of the following combination is true? Q.15) Who among the following sits fifth to the right of T? D.16-20) Study the following information carefully and answer the questions given below. A, B, C, D and E are sitting in row 1 and P, Q, R, S and T are sitting in row 2 respectively. In each row some of them face north while some of them face south. In such a way that persons in row 1 sit opposite to persons in row 2. All of them like different numbers viz. 1, 3, 7, 11, 13, 14, 15, 17, 18 and 30 but not necessarily in the same order. A is an immediate neighbour of C and both of them facing same direction. T sits second to the left of S. R likes the number which is twice the number liked by E. A and R do not face each other. P likes the number which is greater than the number liked by D. Q faces same direction as T who likes an even number which is less than 20. Immediate neighbour of A likes prime number. One who sits third to the right of C faces P. T and D face each other. E does not face immediate neighbour of P who sits second to the left of R. Neither B nor A is an immediate neighbour of E who does not sit diagonally opposite to P. Q likes 13. A likes the number which is half of the number liked by S. E sits in the one of the end and does not like composite number. B does not sit in the middle of the row. C likes 17. Persons sit in the end of the row of the same row faces same direction. B likes the lowest number. A and B faces opposite direction. Q.16) Who among the following likes 18? Q.17) Persons who are likes 14 and 7 faces which of the following directions respectively? Q.18) Who sits third to the right of one who likes 17? Q.19) Four of the following five are alike in a certain way based on the arrangement and hence form a group. Which of the following does not belong to the group? Q.20) If B is related to S, C is related to R in the same way A is related to who among the following?